Don't usually get that "warm and fuzzy" feeling when bowling? Well, that's about to change! 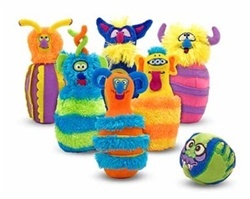 Our amazingly creative monster bowling set adds color, texture and a whole lot of eyes to a familiar game! Includes six furry, textured pins and one beastly ball in a zippered carrying case.